Sunshine. It's great to be able to see the sun. It's good to know that even on a cloudy stormy day the sun is still shinning somewhere beyond the clouds. Bird song. I've seen a cardinal, a robin, and several sparrows heartily welcoming spring with their songs. Fun times at the park with the kids. Take out, 'cause sometimes I just haven't got the time or energy for cooking. Mordern medicines. Spring head colds are a real pain in the neck (literally and figuratively) with out them. This all started because I wanted to find out what "cheb" meant. As I was poking around the internet I discovered several musicians with "cheb" in their names. I realised that it had to be an assumed title. Eventually I discovered that it means young in Arabic but I also discovered that it meant much more than just that. Many cultures around the world have a tradition of social and political commentary through music. I was born in a place where politicians were weary of the popular musicians. One wrong move and they would be flayed by a skillful lyric. I actually remember singing songs that had been banned because they were critical of the government. The fact that as a six or seven year old I knew the words to the banned songs shows the power of those songs. The most of the snow has melted. There are flowers (crocuses and winter aconite) blooming in my front lawn! There are flowers blooming in the neighbours lawns. The basement hasn't flooded (yet). Almost all of my stitches have fallen out. The few stitches that are left are not very irritating. Sis1 and Sis2 made it throw last weekend's snow storm okay. Laughter, even if it still hurts. Al Gore's testifying in Washington DC today about global warming. I can't decide which he makes me think of more, Chicken Little declaring that the sky is falling or a herd of lemmings heading for a cliff. I caught a snippet of his baby with a fever analogy as I was doing some housework. "The planet has a fever. If your baby has a fever, you go to the doctor. If the doctor says you need to intervene here, you don’t say, 'well, I read a science fiction novel that tells me it’s not a problem,' " Gore said. "If the crib’s on fire, you don’t speculate that the baby is flame retardant. You take action. Which prompted me to think, if I think my baby's got a fever I'm not going to take him to the dude who says, "I'm not a doctor but I play one on TV." I'm certainly not going to follow the advice of someone who wants to amputate when soap and water or a cold compress will do. How's that for over doing an analogy? Before I forget and wander off to bed, happy St. Patrick's Day. Ethan and I put in our annual appearance at the local parade. Then we came home to thaw out. Sis1 and Sis2 are here for the weekend (they were weigh laid by yesterday's storm and didn't get here until after one o'clock this afternoon). So I'm still sort of on vacation. It was spring for a few days. The local NRP weather man kept talking about spring fever warnings. I got to go outside and enjoy the warm spring weather and watch the snow banks melt away. Enough snow melted for me to see the daffodil, giant hyacinth, and tulip shoots poking up out of my flower beds. I got to take a layer of blanket off of the bed this week. I got to open windows to let in the warm spring air. Mom came to help take care of the kids and the house while I recovered. I can now see the floor in most of the rooms in the house. Watching Sophia play hide and seek with my mom underneath the display tables in JC Penney. The sight of Sophia with a on old pair of toddler swim shorts on her head asking, "How you like my new hat?" Laughter, even when it hurts. I've learned that laughing with sutures in your mouth is perhaps not the best thing that one can do. 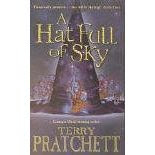 I discovered this while ubby was reading Terry Pratchett's A Hat Full of Sky to me last night. Pratchett is a very funny writer who crafts great characters and great stories. I've been enjoying his tales since high school. Last night every giggle and guffaw came with a wince. It's hard to laugh without moving your face. Good thing I had an ice pack handy. The antics of the Wee Free men (also known as the Nac Mac Feegle), "the rowdiest, toughest, smelliest bunch of fairies ever," had me in...stitches (sorry, couldn't resist). Thanks to the vicodin I can only manage to stay upright for a few minutes at a time. How does anyone ever manage to become addicted to this stuff? I've let it wear off completely twice now which led to the right side of my face feeling like someone had taken a hammer to it (which probably did happen). And I got a ragging sinus headache. The left side of my face didn't hurt much at all. After a couple hours of misery I popped a pill and resigned myself to another day in bed. I'm not actually sure if any knives were involved since the oral surgeon and his staff kept their implements covered until I was fast asleep from my IV drip. I was curious to see the instruments but I was knocked before I could think to ask. In any case I am now short 4 wisdom teeth. The ones that came out whole are now sitting at the bottom of my bag. I am religiously taking the vicodin they gave me. I'm uncomfortable enough on it that I don't want to know what I would feel like if I let it completely wear off. It feels weird when it hits my blood stream though. I've spent the the last nine hours cuddled up with ice packs while mom and hubby run the house. Well, it's really mom running the house and keeping the kids for swinging from the chandelier (figuratively speaking). I think hubby's been grading all day but I'm not sure. He was grading when I left him in the waiting room at the surgeons office. Hubby got his replacement computer from Dell. His old computer that had been lost also came this week. The weather man says that the current cold weather is likely to be the last we'll see until next winter. The little birdies outside the window keep chirruping. I saw the tips of a daffodil poking out of the snow on the sheltered side of a building over the weekend. I wonder what's going on under the snow in my yard? Mom is coming to nurse me back to health after I have my wisdom teeth out on Saturday. The oral surgeon said that my procedure should be simple and straight forward. For him maybe. The following illustrates one of the problems that I have with the environmentalist movement in its current incarnation. Farmers deny cod isn't "organic"
Situation: Organic cod is raised in pens set in the ocean in the Shetlands. The fish farmers use lights to simulate near arctic summer light conditions and stave off maturation and subsequent aggressive behaviour of the cod. Problem 1: Artificial light simulating natural conditions is not considered "organic" by some. Problem 2: Without the light the cod mature before reaching optimum market size. They also become aggressive when mature which would lead to charges of animal cruelty against the fish farmers. This is cool story about light manipulation with nanotechnoloy. Scientists in New York have created a material that allows light to pass through with little or no reflected glare. Potential applications range from improving optical communications to increasing the efficiency of solar cells. The first thing I thought of was my UV reflecting glasses next to the radio I was listening to. Then, scifi geek that I am, I thought, cloaking device. At the end of the piece they played the theme music from Dr Who which really got my attention. Hubby's broken computer may turn out to be a good thing when all is said and done. Winter will end. When is anybody's guess.